According to the latest release by the United States Census Bureau, retail e-commerce accounted for $264 billion of sales in 2013. So, in a vacuum it would appear that with a number that large, internet-based sales are dominating the retail landscape with brick and mortar stores fading away. However, that is not the case at all. The total . . . When analyzing the economic benefits of shopping at independent businesses it always comes back to the amount of money they keep in the local community after the initial purchase is made. 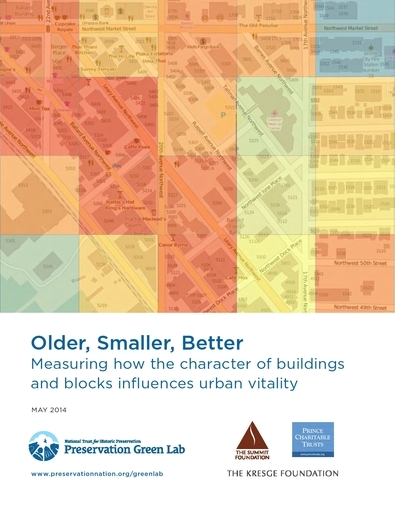 After calculating how large this advantage can be in our Austin and Andersonville studies we realized that this trend would likely hold up nationwide. . . .
Stacy Mitchell linked a fascinating new report from the National Trust for Historic Preservation titled Older, Smaller, Better: Measuring how the character of building and blocks influences urban vitality. They developed a methodology that involved breaking a city down into a series of 200-meter-by-200 meter squares and analyzing . . . Welcome to Localism: By The Numbers. We hope this blog will allow us to share some views and insight into the various methods of looking at the localism movement through numbers and statistics. This will be a combination of presenting our own original work along with highlighting the work of others that has caught our eye and can help put . . .